Home > Products > ChargeIt by Jay Silver Round Acrylic Charger Plate 13"
Impress customers by presenting salads, appetizers, and entrees on the ChargeIt by Jay Silver Round Acrylic Charger Plate. 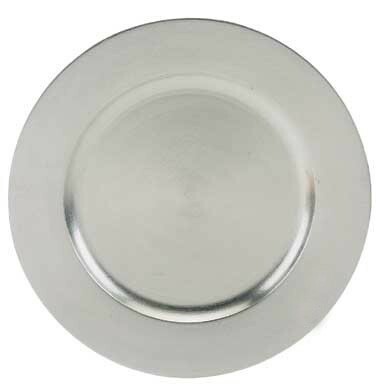 Perfect for fine dining, wedding receptions, and other high-class events, this charger plate boasts a glamorous silver hue with a sleek, smooth finish. Combining style and longevity, this classic and elegant charger is made from high quality acrylic for unbeatable durability. Boasting ample space, this charger accommodates any size plate and prevents spills and mess. This classic charger plate is lightweight, easy to transport, and adds a luxurious touch to any setting without breaking the bank.